The American Dental Association has found it is no longer necessary for most dental patients with orthopedic implants to have antibiotic prophylaxis to prevent infection. Poor oral health care and gum disease have been linked to cognitive decline among Alzheimer’s patients, but it may simply be a correlation. Losing a tooth may not seem like a big problem, especially if it is a tooth in the back of your mouth. You might say, “nobody can see it and I function just fine without the tooth.” In fact, there are 178 million US citizens who have lost one or more teeth. Public health data show that the number of these patients will continue to increase over the next 15 years to more than 200 million individuals. Tooth loss affects the majority of US adults, and as a result, there is a great need for tooth replacement. Why should I replace my tooth or missing teeth? 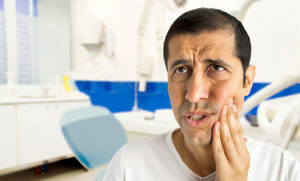 Tooth loss can cause major problems to your bite, creating a big expense to correct. When a tooth is lost, the surrounding teeth begin to shift and collapse into the empty space that the tooth once occupied. See the case below. 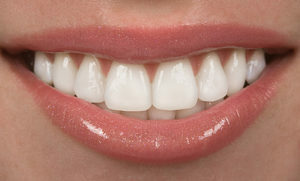 There are 2 options to correct the extreme shifting of these back teeth. 1. Using orthodontics (braces) to reposition the teeth. The disadvantage of this option is that it is extremely difficult and time consuming to move large molar teeth back into the correct position. 2. 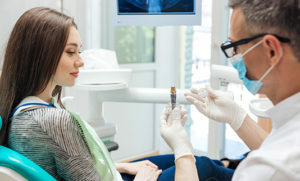 The second option would be to remove the shifted teeth and place dental implants or partial dentures to restore the bite. 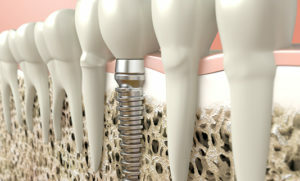 This option is a much quicker and dental implants are very similar in feel and function to natural teeth. The final treatment for this case included 4 dental implants and 5 implant crowns to create natural appearing teeth and a comfortable biting surface. The patient is now able to chew efficiently and eat the foods she enjoys.